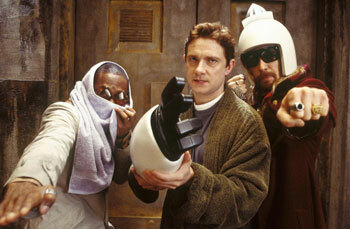 First of all, I have a confession to make: I’ve never read The Hitchhiker’s Guide To The Galaxy. I’ve read the second book, The Restaurant at the End of the Universe, but that’s only because it was free with The Observer a couple of weeks ago. I know a lot of the gags that have made their way into popular culture – 42, the improbability drive, babel fish, etc – and I’ve played a lot of the old text adventure, but the books themselves have somehow slipped through my net. So basically I, like most people in all probability, sat down in the cinema with little in the way of expectations. The random jokes hit more than they miss and there are some great running gags (Marvin the Paranoid Android is usually very funny). It was the improbability drive which provided the most laughs for me every time it was used, ranging from turning characters into sofas and woolen versions of themselves (mmm…woolen vomit) to turning thermonuclear weapons into bowls of petunias and existentialist sperm whales. I’d been reading reviews for this and they seem to be divided – either very positive or very negative (most notably negative in the review from Douglas Adams’ biographer). This led me to suspect that it would be much like the buzz for the Lord of the Rings films in that the fanboys would be indignant about the inevitable changes from the source but everyone else would find it to be a very enjoyable introduction, and on the whole it seems like I was right. My friends who had read the books enjoyed it but found some of the changes galling, and I found most of it to be very entertaining and eccentric way to spend a couple of hours.